The model has been created as a kind of spiral shaped staircase and as you move up floating text with key concepts central to the theory appears. Other than that there seems to be no apparent interaction possibilities with the model. After exploring the model we all went to Media Learning, where Lizzie & Jorn had been able to make use of a presentation setting owned by another (first year) MIL student, Inge Qunhua, who is an experienced and award winning SL teacher. As part of their presentation Lizzie & Jorn started by analyzing the CoP model and I think it is safe to say that none of them or any of the other students was impressed by the model – above all due to the lacking interaction possibilities. My role in these discussions was mainly to listen and observe and it was quite interesting in this case because I did not agree with the students. During the MIL course we have visited other theoretical designs that are based more on interaction between the design and the avatar. 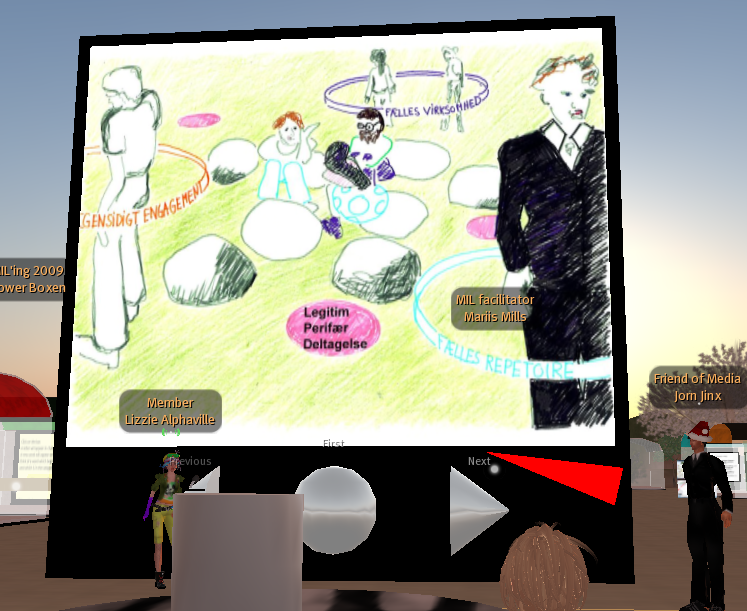 Right next to the Cop model, Thursday Xu has created a build of Bloom’s taxonomy, where questions regarding the theory are posed in the local chat as you move your avatar around in the model and we have also been exploring Zotarah Shepherd’s MI build where the avatar can play instruments or solve a mathematical puzzle as examples of the different intelligences and the MIL students clearly preferred these more interactive designs. In my opinion interaction doesn’t necessarily equal learning. I don’t think my understanding of musical intelligence is enhanced solely because my avatar can be animated to play drums though I recognize that the fun engagement and activity may play an important role in the memorizing process, but there is so much more to learning than just memorizing. In line with Wenger, I believe that negotiation as part of the creation of meaning is essential to the learning process and in this sense my pedagogical foundation obviously is dialogic and I tend to agree with Wegerif. 2006 who finds that one of the goals of education, perhaps even the most important goal, should be dialogue as an end in itself. 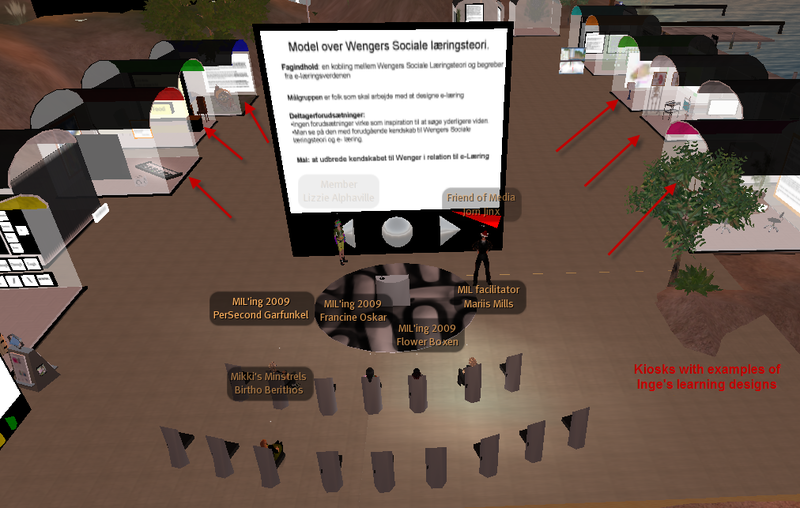 By the end of their presentation Lizzie & Jorn also invited us to join them in trying to place the two CoP models within a third model, namely the model created by former MIL student Carsten Storgaard as I’ve referred to earlier in this post. It turned out to be quite difficult, but started an interesting discussion on models and their usability in general.